John Donne made an appearance on Jeopardy! on Tuesday, January 31, 2017 (Show #7457). Here are the questions. The contestants were Doug Baker (a sustainability specialist from Tecumseh, Michigan), Ben Smolen (a writer from Los Angeles, California), and Lisa Schlitt (a microbiologist from Berwyn, Pennsylvania). How much would you have earned? Doug missed this one. It was a daily double. Not sure what that means. Arguably, this was as much a monarchy question as a Donne question. Apparently, this was a “triple stumper,” meaning none of them got it. Interestingly, three of the five were about Donne's prose works, and none of them was answered correctly. Sigh. The answers are available at J!Archive. This project is an initiative of the John Donne Society. 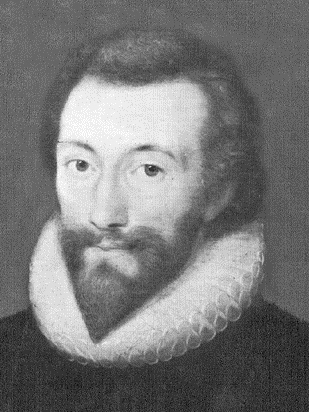 Our goal is to build a digital archive of primary materials related to the prose works of John Donne. This is a collaborative project. We invite participants from all walks of life, both professional and amateur scholars. If you think you might like to get involved, please contact us here.